This ancient symbol of symmetrical, overlapping circles represents the connections we foster throughout life. 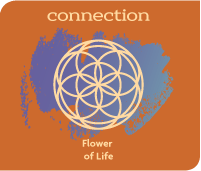 The intricate petals of the Flower of Life illustrate how individuals can tap into a web of connection and encompass the whole. From ancient times, circles have embodied unity. They are the inclusive site of rituals and a space to engage with wisdom, balance and clarity. We “circle up” when we want people to feel safe and welcome. The seasons cycle. Nests are round. And, of course our universe is full of potent circles…earth, stars, sun, moon. Connection is our key. We open wide the channels of communication. We build real relationships with our collaborators. We know that what one of us does affects us all and that true connection lasts and grows stronger with time. We connect to you so you can connect to your world. 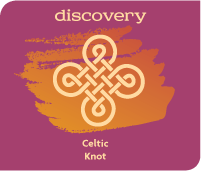 The interlaced weaving of knots emulates timelessness and continuity. It’s about delving and diving and revealing what’s hidden below the surface. Going deep. Discovery leads to insight, but also to more delicious questions and sheer delight in the act of seeking. The knot has no beginning and no end. Its loops take you for a ride around new corners and pockets of discovery. Knots represent longevity and also good luck for new adventures. We are thrill-seekers…searching for inspirations that pop out as a “Yes!” We press the edges of our horizons— in books, in gardens, in conversations. Our curiosity is perpetually in process and at play. We seek. And when we find answers, we see synchronicity all around us… everything interconnects. This looping, petal-like symbol traces the star-shaped fruit of the kola tree which contain kola nuts. This West African crop represents abundance, unity and the way trade has the power to bring people together. 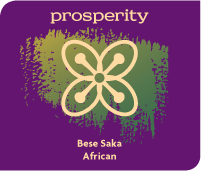 The Bese Saka symbol conjures images of flourishing and thriving in a healthy way. It denotes success beyond the measure of money. The loops of the symbol remind us of butterflies and the butterfly effect…we each have the power to influence the lives of others in a positive way. We flap our wings over here so you can feel them over there. There’s give and take. We believe energy should flow, and that’s true of money, too. Our work is dedicated to generating flow for you and your projects. There’s plenty to go around. The Maori people of New Zealand crafted this spiral to represent the idea of “loop.” The unfurling of a silver fern frond inspired the symbol which stands for growth and renewal. 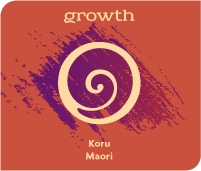 The Koru calls up creativity…urging newness and stimulating growth. The spiral celebrates change as we evolve to encompass the breadth of our potential. We return again and again to the same point of reference, but at new levels, new heights and with new perspective. Our creativity is dynamic, evolving with each adventure. When creativity is awake, we grow; what we say to the world branches out in delightfully unexpected ways. Growth doesn’t have to mean merely “more.” Growth happens when the clarity of our intention meets hard work. The two flow together, gathering energy. This kind of charisma draws in friends fans, and collaborations.